Availability: Did you just trip? Then look down. Oh look! 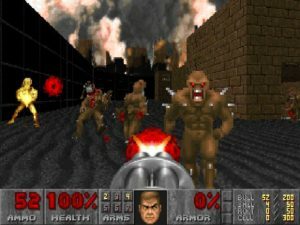 A copy of Doom II. Doom II – now in a library! That’s not to say the original review wasn’t accurate though. Coming out less than a year after the first, this is a sequel in the truest sense. The engine has received only a few back-end tweaks, all of the monsters and weapons from the first return, and absolutely nothing about the core gameplay has changed – you still can’t jump or look, you’re still searching for keys, and there’s no interaction with the environment beyond lifts and traps. You could say it’s an uninspired rush job, and I’d have a hard time disagreeing, but at the same time this is a nearly perfect iteration. I look at this more as a pinnacle refinement of original Doom‘s gameplay. Or to put it another way, the gaming public was clamoring for more Doom, and that’s exactly what the sequel gives them. The action now takes place on Earth, where the nameless Marine finds the invasion of Mars was just a diversion from the demons’ real prize. Doom’s episodic structure is thrown out here for a linear campaign of 32 levels (two of which are secret throwbacks to Wolfenstein 3D). There are still text screens relaying scant plot at certain points, and there is a general progression from suburbs to the downtown city center and back to Hell, but without the episodic structure, you cannot jump ahead in the levels without use of cheat codes. City levels are great fun, but full of sniping spots for the beasties. These city levels highlight the most noticeable engine improvement, which is to allow much larger, open levels. These offer some attempt to make the “Hell on Earth” mean something more than just idle words on the box. You’ll see city blocks with individual buildings, towering skyscrapers that you could ride lifts to the top of, courtyards full of zombies, and monsters in the streets. Of course, these are still the same industrial and castle textures, so every building looks like brown stone, and the streets are the same dirt and grass from before, but you get the idea of what it’s supposed to be. A killer sky texture of a ruined Earth city sells it further. I know there are people who hate the levels in Doom II, or find them lazy compared to those in the first, but I simply don’t agree. 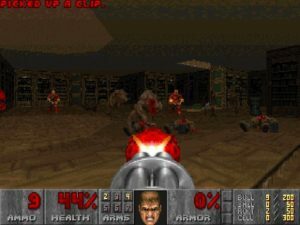 Just as the first, these levels are exceedingly complex, with twisting passages, varied elevation, and hidden keys that were the staple of original Doom. It can sometimes be difficult to find where you’re supposed to go, but even on a recent replay, I never got lost or felt I was spending too much time in one level. And if you already hated that “monster maze” gameplay of the original, the sequel won’t convert you. However, the open city areas do offer some legitimate variety to the combat, and some (like “Suburbs”) use the individual buildings neatly as separate, contained challenges. 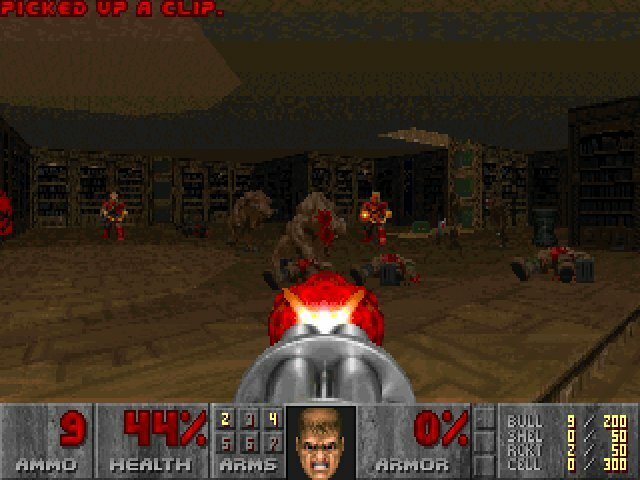 Doom II also embraces the puzzle aspect, with aptly-named levels like “Tricks and Traps” and “Gotcha!” Careful planning will be required to avoid getting caught by the multiple monster closets or shifting geometry. 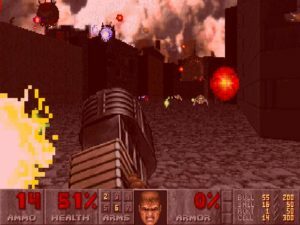 A particularly nefarious level titled “Barrels o’ Fun” requires you to outrun chain-reaction explosions through hallways full of Doom’s trademark explosive barrels. Finally, there’s a few straightforward combat challenges (like the arena-style “Dead Simple”) that will test both your reflexes and knowledge of how best to tackle each demon type. id clearly had fun with twisting the conventions they set up in the original, and there continues to be a bit more thinking involved than just running around and shooting things. That’s the Arch-Vile there on the left. He’s bad news. All the original monsters return, along with roughly the same number of brand new, much tougher models. There’s a beefy zombie with a chaingun that can shred you in seconds. There’s the skeleton with homing rocket launchers on its shoulders and a brutal right hook. There’s the obese behemoth with powerful twin flame guns for hands. There’s the floating brown orb that belches out the damnable flying skulls, which can fill up a room quickly if not taken care of. Two lower-grade versions of original boss monsters appear – the brown Hell Knight and the plasma-shooting Arachnatron – but their comparative weakness is offset by appearing far more often. And of course, the aptly named Arch-Vile, who not only regenerates the demons you just splattered, but also charges up some pyrokinesis to blast you across the room for half your health. Every one of these new monsters pushes Doom II toward an even greater emphasis on using cover. Nearly every new enemy does severe burst damage that will take you apart if you try charging them, or try ignoring them as you race around the room. Their new weapons use various methods of tracking to ensure that strafing alone won’t save you. The only thing you can do is break line of sight, forcing the Arch-Vile’s pyro blast to stop charging, or the Revenant’s homing missiles to crash harmlessly against the geometry. 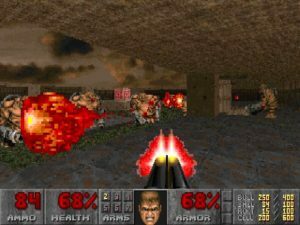 If you played Doom like a raucous monster mosh pit, you’re going to be in real trouble at Doom II’s higher difficulty levels. If it’s sounding brutal, it is – and you’re going to need some serious firepower to take these fuckers down. That’s why Doom II opens up the arsenal and provides you with loads of brand new weapons to fry demons with. Weapons like the duck gun, and… ah… no, that’s it. Apparently after stepping off the shuttle from Mars, the National Guard base was miles away, but the K-Mart was right there. As the only new weapon to the game, the double-barreled shotgun might not be the BFG upgrade you were hoping for. Instead, it shoots two shells at once for nearly 3x the damage over the single-barrel classic. This may not seem like much, but it can take down groups of zombies or imps at close range, and puts the hurt on larger monsters as well. If nothing else, shotgun shells continue to be the most prevalent ammo in the game, and this “super shotgun” lets you put those stockpiles to efficient use against the numerous new mid-grade baddies. You can’t afford to use rockets on everything, after all. Graphically, there’s not much new to say. Facilities and factories on Earth give the team license to reuse many of the industrial textures from the first game, and as said before, future Earth apparently has a massive surplus of brown stone. There are new textures, but they fit in with the originals so well that it’s difficult to point to anything as a clear addition (for both better and worse). Similar story with the sound – there’s new MIDI guitar riffs that fit right in (still sped-up ripoffs of Pantera, Metallica, and Slayer), which continue to supplement the action perfectly. The one notable new sound is for the double-barrel shotgun. Its thunderous bark is a delight, and with a subwoofer attached to your setup, it sounds like God’s own handcannon. Doom II really is more of the same, but released at a time when “more of the same” was exactly what everyone was asking for. Loads of smartly-designed new monsters offer formidable tweaks on the original’s challenges, larger levels look and play differently, and the double-barrel shotgun fills out the arsenal nicely. It’s also the modding community standard, and where most of the best Total Conversions and user episodes reside. 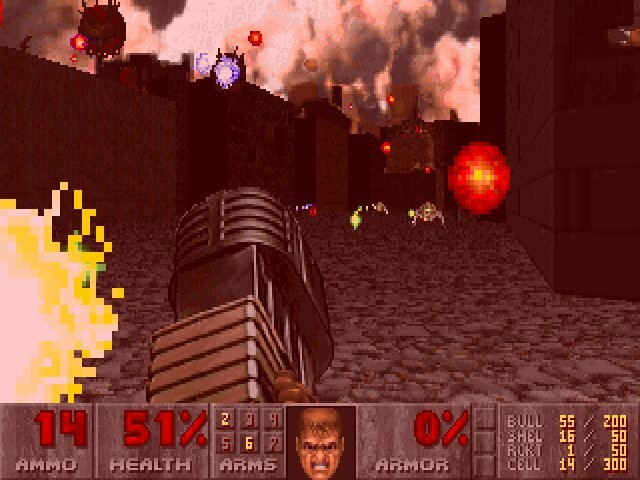 The original is an excellent game as well, but Doom II’s additions edge it out as the best. A full pack of new levels, a rogue’s gallery of new monsters, and one of the greatest shotguns in gaming history. It’s truly hard to ask for more. My only complaints are petty ones. It would have been nice to have more new weapons. It would be neat if there was a new gameplay factor or engine trick. And of course, if you didn’t like the original, there’s absolutely nothing in the sequel for you. THE INVASION IS OVER. EARTH IS SAVED. HELL IS A WRECK. YOU WONDER WHERE BAD FOLKS WILL GO WHEN THEY DIE NOW. I have many happy memories of jerryrigging various Apple-specific DOOM II-modding tools together on our family computer back in the day (for example, you couldn’t just change 1 sprite, you had to make a whole-game WAD file and patch various sprite-changes built by other people into it). I briefly tried Dark Forces modding, and again with Duke 3D, but couldn’t even get past the tutorial stages of level building. I was pretty much just crap at it. Doom II modding was certainly a huge deal at the time though. Wasn’t there a how-to book in stores? Came with some software? Yes, J Man, also had it for Duke 3D, I was also very young back then and spoiled!